A list of all the tools and machines that you need. 23 items listed that are necessary to run your business effectively. A list of all materials needed during construction. 12 items listed. Guidelines for mixing paints and oxides. 7 items listed. A complete step-by-step guideline on how to stain chipboard and supawood so it resembles hardwood. Oxide colour mixes that will give you variations in the colour of the end product. 6 different colour mixes shown, which you can play with to create your own colours. Diagrams of seven jig sizes and placement of the support blocks. The jig is used to construct the actual coffin. Also included is a photo of the completed jig. Notes and diagrams on how to construct the jig. The jig is only made once (for each of the seven different sized coffins). When done the coffin is constructed around the jig. Sizes of the 7 completed coffins (from stillborn to adult). 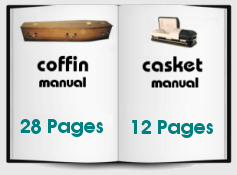 In the manual the are referred to coffin 1 to 7, 1 being stillborn and seven being adult. Step-by-step instructions, notes, diagrams and cutting angles on how to construct the number 2 coffin around the jig. Includes a photo of one side panel attached to the jig, as well as a photo of the completed product. How to do the side panels, floor, head insert, toe insert and lid. Placement of screws, panel pins and skirting on the coffin, including diagrams and a photo. Seventeen guidelines and tips during construction. 17 items listed. Securing the plastic lining and fitting the trimmings. How to construct oversized coffins, i.e. coffins larger than the standard adult size. Guidelines on positioning of handles and decorations on coffins. This covers all 7 sizes. A short synopsis of legal requirements. A cutting guide for the 7 coffin sizes with built in safety margins. Once you are familiar with all the sizes you can prepare your own cutting guide without the safety margins, which will save on wood. Cutting guide for the seven coffin jigs. How to secure the floor panel properly, as this carries most of the weight. 8 different diagrams of coffin lids. You can also design your own. Sizes of the seven templates, which are used to construct the jigs. Online links showing you how trimmings are fitted. Guidelines on safety, health, environment and quality. Guidelines on different woods and their specific properties. Instructions, sizes and diagrams on how to construct the box. Instructions, sizes and diagram on how to construct the frame. Instructions on how to complete and secure the floor panel. How and where to place the hinges and mounting the frame onto the box. Instructions, height, angles and diagrams of the lid support. Instructions and diagrams on construction the flat lid. Diagrams, instructions and placement of skirtings and corner blocks. Different pre-made trimmings and supplier. Diagrams and sizes of all panels and how to secure the joins. How to stain or paint the casket if MDF foil was not used. Different sizes of the infant, teenage and adult caskets. Picture of the finished product plus the interior trimmings.